If a child is going to be absent from school, the parent/caregiver should ring the school office by 9.00 a.m. on that day. Please give the teacher an advance warning of any planned absence. Lunch orders are currently under review but we usually have a fish and chip lunch on the last Friday of term. Ouruhia has a compulsory school uniform. Colours are jade for the top (polo shirt or skivvy) and navy blue for the bottom (shorts, culottes or track pants). There are also navy blue sweatshirts and polar fleece tops. Uniform items can be purchased from The Warehouse, Northwood. Brimmed or bucket-style sunhats are compulsory in summer. Shoes need to be suitable for a wide range of school activities, including Phys. Ed. (no platform soles). There is no dental clinic at Ouruhia School but children are often screened by a mobile clinic. Children are then referred to the Northcote Community dental clinic (24 Tuckers Road) for further treatment if required. A dental therapist contacts the parents with appointment times. Parents are responsible for taking their children to the clinic. Ph 0800 846 983. Year 7 & 8 pupils attend Technology & Workshop classes (covering workshop technology, food technology, and sewing/fabric) at Christchurch East School each Monday afternoon. They catch the bus from school at 12.30 p.m. and return by 3.15 p.m. Pupils are required to pay for materials used at Christchurch East. They will be advised of the cost at the beginning of each semester. Assemblies are held on Friday mornings at 9.00 a.m. in the Library with the whole school attending. Parents are welcome to attend. Assemblies are for focusing on Our Values, sharing class achievements, singing, and giving out certificates and awards. Classes are rostered on to organise and run assemblies (usually once or twice per term). Classes start at 8.55 a.m., and finish at 3 p.m. on most days. It is appreciated if pupils arrive before 8.45 a.m., but no earlier than 8.30 a.m., and leave by 3.30 p.m. unless special arrangements have been made. Morning tea is from 10.45 – 11.15 a.m. followed by 15 minutes eating time. Lunch break is from 12.45 to 1.15 p.m. followed by 15 minutes eating time. Pupils are given a stationery order list at the end of the year or when pupils start. All stationery items must be purchased from the school office. This is to ensure that all children have the same stationery. The cost of this stationery is very competitive to other stationery outlets with some items being cheaper. 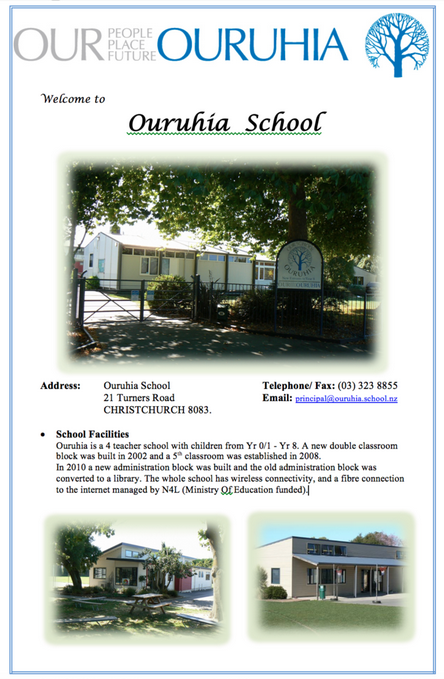 Ouruhia has an up-to-date, wide ranging collection of book and non-book resources to meet the recreational and learning needs of the children. The library collection is computerised with issues, returns and stock-takes being done with bar-code readers. Children are encouraged to read and regularly borrow books. Children can borrow 2 books at a time for a period of 2 weeks. Please respect the value of the books taken home and encourage their being both read and cared for. A charge is made for lost and damaged books. We believe that all kiwi kids need to learn to swim. Ouruhia is one of the few schools which still has its own pool. We value the ability to have daily swimming lessons on-site during February, and we supplement these lessons with sponsored lessons at Kaiapoi Aquatic Centre before the Christmas break. Families and members of the community may use the solar-heated pool outside of school hours. For both safety and protection of the facility certain regulations apply, and the gate is kept locked. Adults may apply to the school for a key for a season. They must agree to comply with regulations and children may only enter outside of school hours when accompanied by an adult. (over 18 years) The fee is set each season by the B.O.T.